Calling all USS Bainbridge CGN 25 Fans! Topic review - Calling all USS Bainbridge CGN 25 Fans! Post subject: Re: Calling all USS Bainbridge CGN 25 Fans! was presented today with a request from someone whom I work with.. They would like to have a model for the local american legion post.. have sent a request for information from Iron shipwrights.. they produced the only kit I know of and also have ordered the ray bean CGN DVD to help with the project however several ? remains. So, I need some blanks filled in so here are my ? This idea makes me wonder about making a Bainbridge version (565' x 58') of a Burke Flight I/II DDG (505' x 66') with a Burke superstructure and radar arrangement split between forward and aft but with the Bainbridge WIP upgrades. A Burke structure with an Mk71 8" gun forward a 32...likely 64 cell...VLS forward, a grouping of 8-16 Harpoons amidships, and an after super structure supporting the aft SPY arrays and CIWS and a helo landing pad aft. Then even imagine the same thing with a helo hangar amidships and landing pad just aft of that while supporting the aft 64-cell VLS. WOW...talk about warship. This idea makes me wonder about making a [i]Bainbridge [/i]version (565' x 58') of a [i]Burke [/i]Flight I/II DDG (505' x 66') with a [i]Burke [/i]superstructure and radar arrangement split between forward and aft but with the [i]Bainbridge [/i]WIP upgrades. A [i]Burke [/i]structure with an Mk71 8" gun forward a 32...likely 64 cell...VLS forward, a grouping of 8-16 Harpoons amidships, and an after super structure supporting the aft SPY arrays and CIWS and a helo landing pad aft. Have to order new parts from ISW. Most are all warp. ...was presented today with a request from someone whom I work with.. They would like to have a model for the local american legion post.. have sent a request for information from Iron shipwrights.. they produced the only kit I know of and also have ordered the ray bean CGN DVD to help with the project however several ? remains. So, I need some blanks filled in so here are my ? I had to dig pretty deep into my e-mail for this one. "...there was a $92million Warfighting Improvement Plan built out to the level of detailed design and ready for long-lead funding in 1987 that would have pulled a Leahey CG first to prove the concept and then Bainbridge. The work would have been to replaced her forward Mk10 mount and magazine with a Spruance-class style 500 round magazine with SALGP and long range guided rounds for the Mk71 Mod1 8"/60caliber 8" gun and replaced the ASROC launcher and below-deck magazine with a 29-cell VLS "A-sized" module and support equipment. The aft Mk10 and magazine would have been replaced with a 61-cell VLS and its support equipment. Both VLS decks would have supported the SM-2, ASROC, and TLAM. There was no need for these ships to have hangars as the Ticos and Sprucans were packing 2 a piece. "There was a lot of talk about reviving the Mk71 gun program and an initial order of 15 guns that would have been split between the non-VLS Sprucans and a few Leaheys and Bainbridge. The next order would have fleshed out the Leaheys and CGN-9 in her strike cruiser WIP." It turns out from a recent GHWB biography that those plans along with upgrading and maintaining the Iowa-class battleships until 2015, Forestall-class CVs, and all NTU ships (CG and CGNs) were concessions to the dissolving Soviet Union in a gesture of good faith to prevent the "use it or lose it" attitude the Warsaw Pact still had in the early 90s. Quite literally these naval assets were traded to prevent a conventional war in Europe (WWIII). [quote="MAJOR-B"]...was presented today with a request from someone whom I work with.. They would like to have a model for the local american legion post.. have sent a request for information from Iron shipwrights.. they produced the only kit I know of and also have ordered the ray bean CGN DVD to help with the project however several ? remains. So, I need some blanks filled in so here are my ? 3. did she embark any helo's it appears to have a hangar...[/quote]I had to dig pretty deep into my e-mail for this one. Bainbridge had quad Harpoon launchers installed where the 3"50's were, on each side, near the aft SPG-55 Fire Control directors. 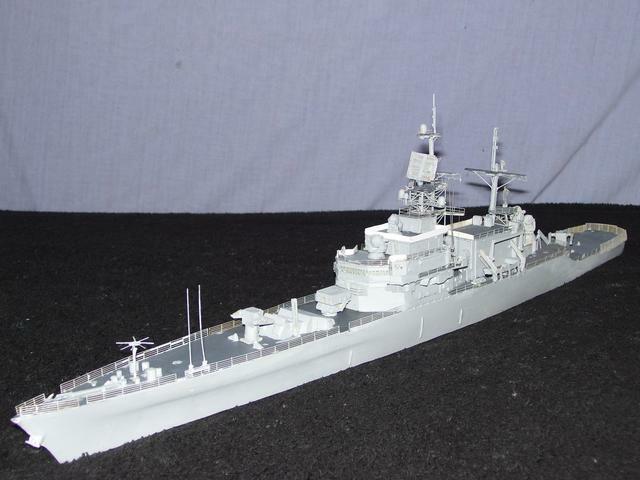 2 20mm CIWS were also added on raised platforms mid ships either side. 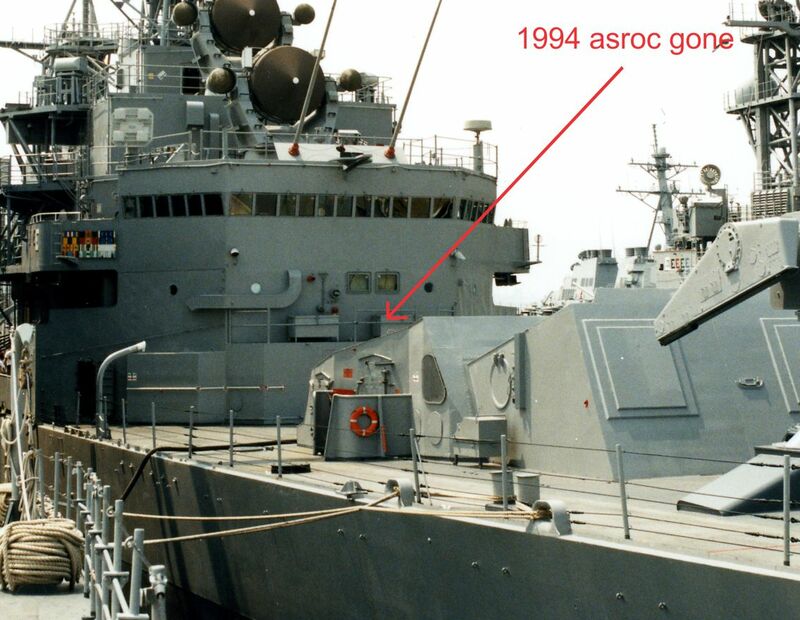 The ASROC Launcher was removed in the early 90's and nothing was installed in it's place. Tomahawk Armoured Box launchers were never installed on Bainbridge. Long Beach had Tomahawk Armoured Box launchers installed where the Aft Talos launcher was and can be seen in this photo. Tomahawk Armoured Box launchers were [u][b]never [/b][/u]installed on Bainbridge. [b][u]Long Beach[/u][/b] had Tomahawk Armoured Box launchers installed where the Aft Talos launcher was and can be seen in this photo. Probably the Wikipedia data was based on the Navysite.de data, so I wouldn't take it as though the two sites independently came to the same conclusion. 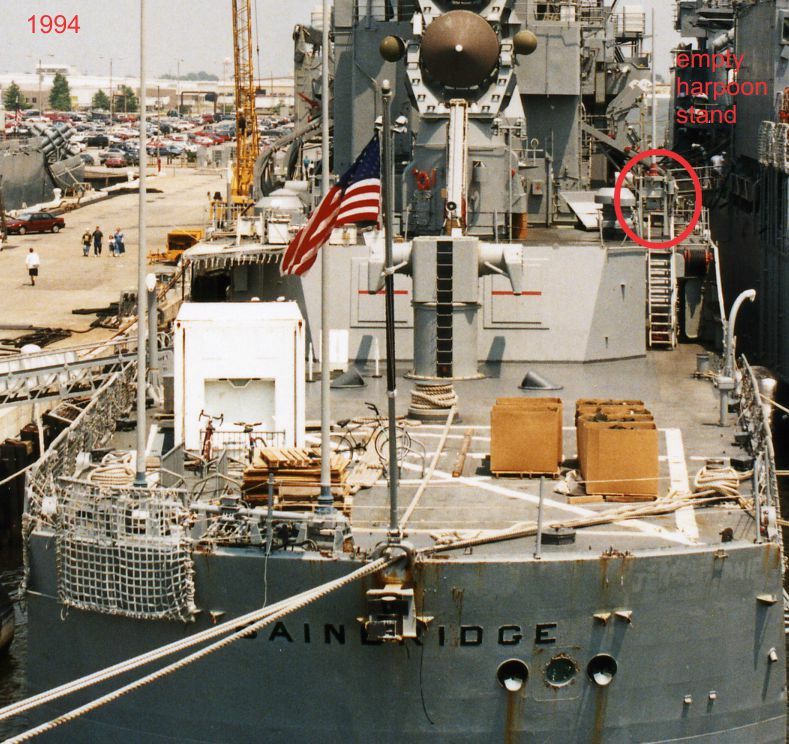 the only room for them would have been on the roof of the aft superstructure but as that 1991 picture I linked does not show them there or anywhere else on the decks of that ship then I'm inclined to not think she had them between the picture time & ship decommissioned. According with Wikepedia, 8x BGM-109 Tomahawk in two armored box launchers were installed aboard USS Bainbridge CGN-25. What's the location of the armored box launchers installed? Got my waterline ISW Bainbridge the other day. Post some photos tomorrow. I'm familiar with the story of JFK having the 5" mounts added to Long Beach, but Bainbridge was built with 2 twin 3"50 mounts in those tubs. They can be seen in her sea trials photos. I served on her. And one of the sea stories about her (which is true) is that when they were showing the "Nuclear Navy" to JFK, the Navy was saying, Here's the Enterprise, it can sail around the world without refueling. They showed some aircraft launching. And here are her escorts. Showing the Bainbridge and the Longbeach. They are going to prosecute a missile. The target missile was fired, the ships returned fire. They missed. All the Navy officers were golf clapping and very impressed. The President ask, "Now let me get this straight. Neither of those ships have guns to fight with?" The Navy officers said, "That's right sir, they only have crew served machine guns." The president responded, 'That's wrong sir." For her first few years. She had two 40 mm Bofors Canon tubs welded to the deck approximately where the harpoon launchers were later placed. The weld marks were still visible while I was aboard her. The reason the USS Bainbridge was built without the 5" guns that are concidered standard fair on modern Cruisers is it was built as the last of the Leahy class which had missile launchers fore and aft and no guns. Like what was said above the Nuke Cruisers were decommisioned due to re-fueling cost. Adm. Rickover lost the battle in congress to have the Ticonderoga Class all be nuclear powered. The much vaunted CGN-42. 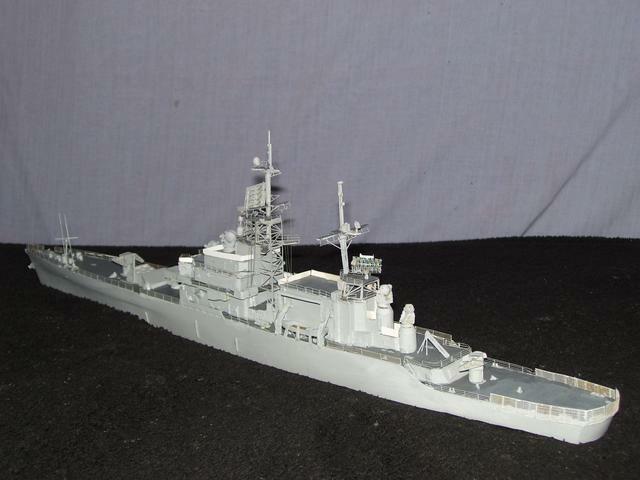 In that battle he had blocked upgrades to the existing cruisers including USS Long Beach. In a nut shell, as the Aegis system came to dominate AAW in the navy the Nuke Cruisers were felt antiquidated and let go. The Texas was in the middle of refueling with the new rx paid for and they scrapped her. A sad and cautionary tale. 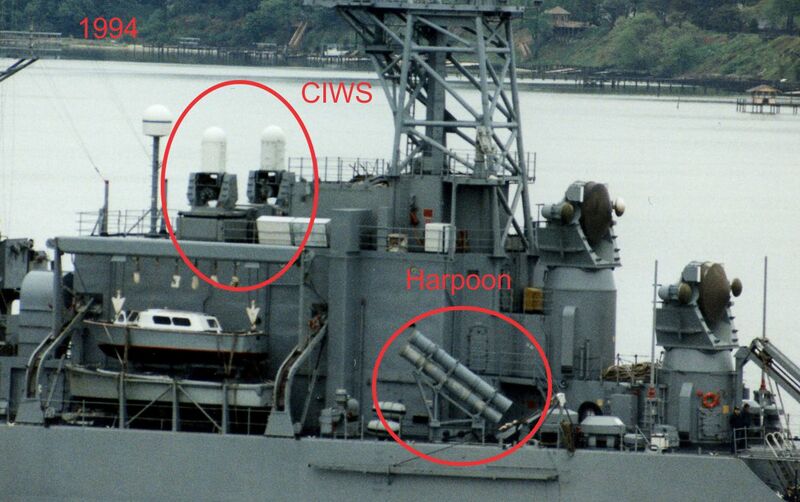 3"50 twins were replaced by harpoon launchers in 70's upgrades, along with CIWS added. All nuke cruisers were decommissioned instead of upgraded further, stated reason was too expensive to refuel. No hangar, only landing pad. Helo carried sometimes. Post subject: Calling all USS Bainbridge CGN 25 Fans!